The bag of tendrils, spinach and arugula is real spicy! We usually eat it raw with oil and lemon. Toss potatoes with oil and 1/2 teaspoon each of salt and pepper in a large 4-sided sheet pan, then spread evenly. Roast, stirring once, 10 minutes. Stir in sliced garlic and roast 10 minutes more. Sprinkle with cheese and roast until cheese is melted and golden in spots, about 5 minutes. 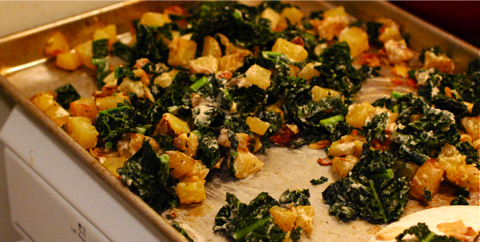 Toss kale with hot potatoes and any garlic and oil remaining in pan, and pop back into the oven for 3-5 minutes. Remove from oven and toss with tahini sauce and salt and pepper to taste.